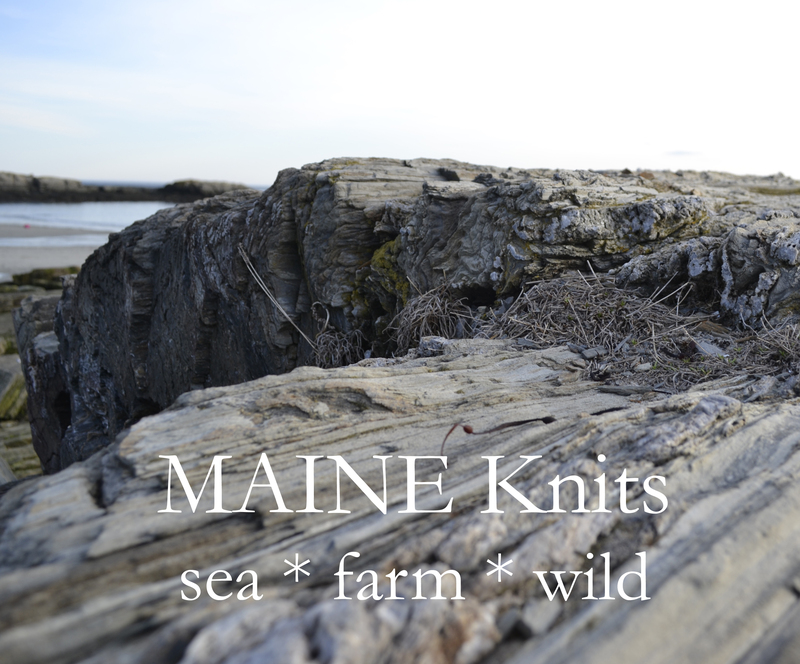 Sponsor: MAINE Knits is a collaboration between the hand knitwear designers, yarn makers, dyers and wool-loving folk of Maine. 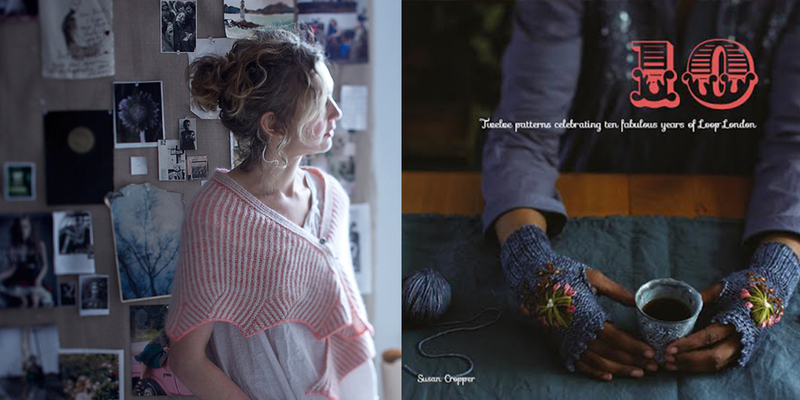 The book includes patterns for 7 garments and 7 accessories, photographs and essays, with knitting designs by Carrie Bostick Hoge, Alicia Plummer, Bristol Ivy,Cecily Glowik Mcdonald, Mary Jane Mucklestone, Elizabeth Smith, Leah B. Thibault, Kristen TenDyke, Leila Raabe and Beatrice Perron Dahlen. 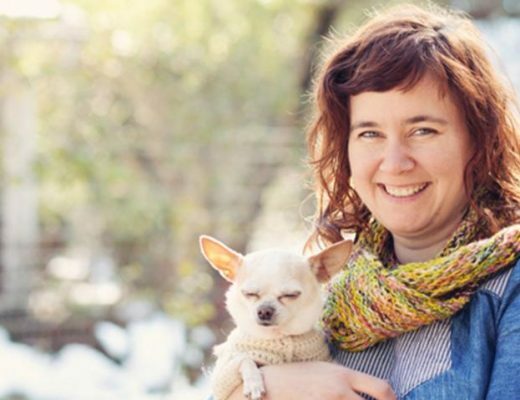 And a foreward written by Pam Allen of Quince & Co.
MAINE Knits was born of an idea from Beatrice Perron Dahlen, and is a project that comes straight from the depths of her heart. 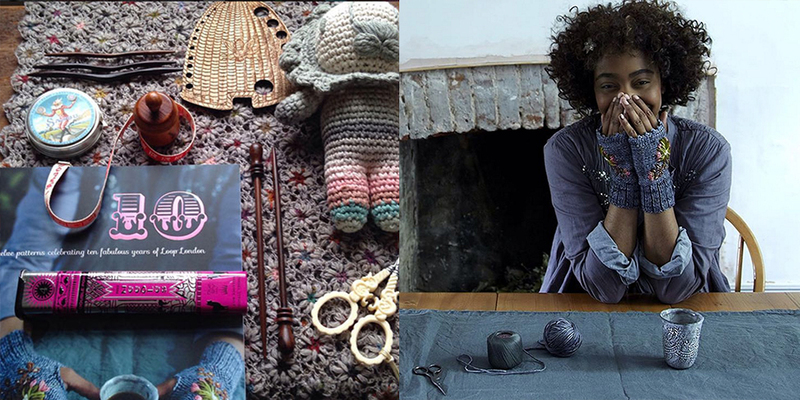 It’s a chance to honor the creative work that her and her fellow Maine folk are doing, joining talents to make something extraordinary to offer up to the rest of the hand knitting community. 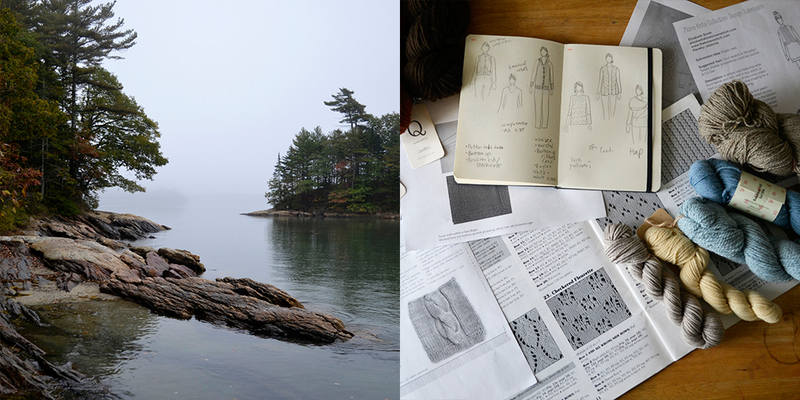 Right now you can support this special project on Kickstarter to help fund the creation and publishing costs…so make sure to visit kickstarter.com and search for MAINE Knits and do what you can to support this great endeavor and it’s collaborators. Update: It’s been awhile since I’ve given an update on Woolful and the farm, so I thought I’d share a little of what we’ve been up to. As some of you may have noticed, I’ve settled back into the weekly schedule for the podcast and it’s really nice to get back to that normalcy. Between a new life on the farm, motherhood, working and traveling to San Francisco each month where I lead design at a tech company, it’s been a fun challenge figuring out how all these things come together. Over the past few months I’ve spent a lot of time reflecting on the next steps for Woolful and slowly, but surely the stars are aligning for some exciting things I’ll share more about in the coming months. If you follow me on Instagram than you may have seen the adventure we had last week with our Dexter cow Lulu and our three Maremma livestock guardian dogs. As we’ve been transitioning the animals from their Winter paddocks to the rotational paddocks, the dogs have been antsy to get out and explore our surrounding forest and neighbors pastures. Lulu believes very much that she is one of them and if at all separated she will bellow till the sun goes down and then bellow all night long. So, one particular day when the dogs ran off, Lulu busted straight through the fence and took off after them. Three pups and a cow, running through the forest and fields and down the country road for nearly three hours. It was quite the sight and accompanied by calls from neighbors, “We just saw Lulu and your dogs running up the road down by so and so’s property.” Oh my goodness, it was a bit stressful and at the same time exactly where I wanted to be…running through the woods, sloshing through pastures and then walking my cow all the way home down the road. A couple days later Lulu came down with some bad bloat. I being the new farmer that I am had no idea what caused it and the vet was sure she had grain overload or got into something nasty. He didn’t think she’d make it through the night and if I’m being honest, I was heartbroken and cried that night as I sat with her and worried. But here’s the deal, we’re ultimately not in control. I began preparing for what might likely happen and kept telling myself what so many others before me had said, “Life and death is the first lesson in farming”. So prayed for grace, that we would be granted grace for our ignorance and lack of forethought. Thankfully she made it through the night and when the vet came the next morning he was surprised to see her looking mildly better despite her distended middle. After checking her out he assured us that she was most likely on the road to recovery and gave us some tips about poisonous plants in our area to watch out for. And today, exactly a week later, she’s doing so much better. I’ll be posting a much more detailed recount of this event on the blog later this week, along with some interesting photos. Giveaway: The winners of last week’s giveaways are Caitlin Johnson, you’ve won a copy of Annie Rowden’s Earlyrising hat pattern and 2 skeins of Wing and a Prayer Shetland yarn, and Michelle Miller you’ve won a copy of Mary Jane Mucklestone’s book 150 Scandinavia Motifs. Congratulations! The giveaway this week is sponsored by Loop London and we’re giving away a copy of their most recent book “Loop’s 10”. To enter and be one of the winners, leave a comment on this blog post. Thank you for your wonderful podcast! I have become obsessed and am listening through the archives. I would love to be entered in the giveaway as well. Can’t wait for your podcasts! Thank you! Loop London is wonderful! Thanks for featuring them. Such beautiful images on the blog and Instagram. I look forward to the podcast each week. Thank you! Someday I will make my way to London again and visit the heaven that is Loop! Glad Lulu is okay! Yay, so happy that dear Lulu is on the mend. Please keep us posted about your animals and people too! First time listener–what a great podcast! Thank you! I look forward to the podcasts each week and would love to be entered in the give a way. Thanks for your work, Ashley. I love hearing your farm stories! It sounds like there’s never a dull moment. I can’t wait to bring animals onto our property, so I live a bit vicariously through your stories. I love listening to your podcasts. Loop London sounds wonderful & I love how her dream came about! I also liked hearing about the adventures of the cow doggie and and also glad she’s on the mend! Would absutely love to win a copy of Loop’s 10. Will be visiting London from Australia in July and I will be purhasing their first book Juju’s Loops and buying yarn to bring home. Love to hear the podcasts too. Your postcast is so great to listen to, would really enjoy knitting the project`s from Loop`s 10. God I was knitting while listening to this latest episode and I actually had to stop and collect myself when you told the story about Lulu – is there something wrong with me when I am getting emotional about a cow I didn’t even know 🙂 Anyhow I am glad it all worked out for you and for Lulu. I wish I had been more into knitting and had known about Loop in my previous trips to London – hope to get there on my next visit. 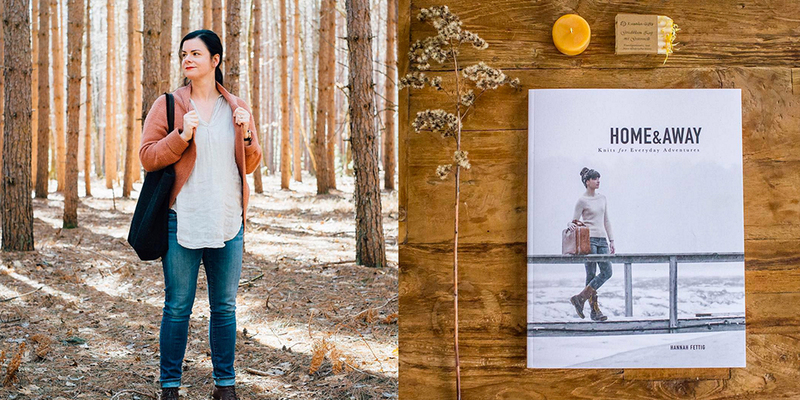 So many of my favourite designers are featured in the Loop 10 book — would love to win a copy! 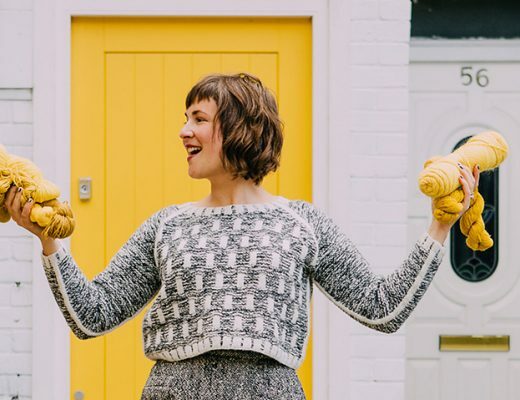 So much excitement – knitting kickstarter! loop of london sponsoring the giveaway! Thanks for another Woolful Week! Another lovely podcast. So much inspiration, thank you! Love the energy that Loop of London has. Another interesting and great podcast. Thank you. Yay, I’m so happy to receive Annie’s pattern and the Wing and a Prayer yarn! 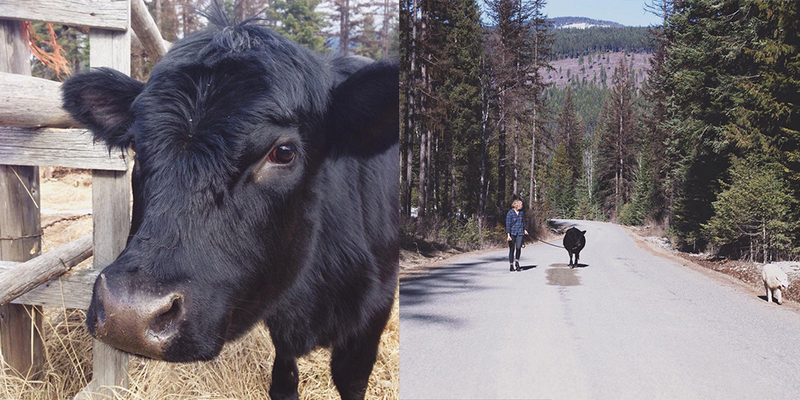 Despite Lulu’s recent escapades, you’ve got me dreaming about keeping a Dexter cow someday. I wish I could visit Loop London!! The photos are so enticing. I have long wanted to visit Loop London and listening to the podcast just made me long even more. 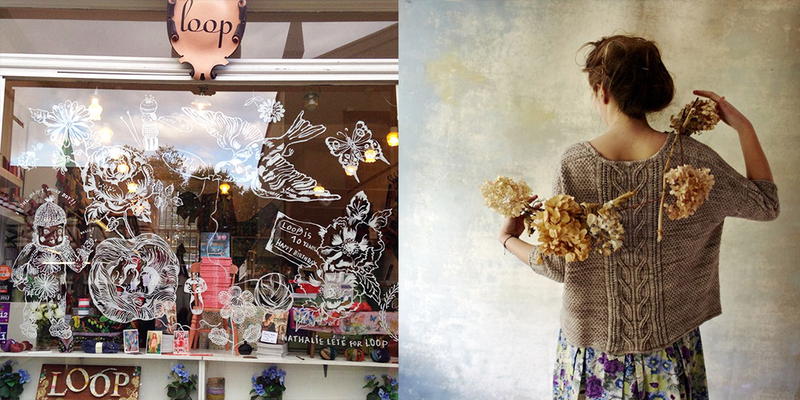 I love looking at Loop London’s website and photos – can’t wait to visit next time I’m in the UK! Great episode! I loved hearing Susan’s story! Thank you! I love listening to your podcasts. I look forward to them each week. My mom listens too and we always chat about the beautiful yarn and wool. I just love listening to your podcasts! They are my go to to listen to on my walks or while I am in the kitchen! I love all the photos of Loop. I’ve heard about the store before but never had a chance to see it. I checked out the photos of the book patterns. They are lovely! Love the podcast!! Keep up the good work!! Next time I’m in London this place is surely on the list. Great episode! Would love to get to Loop someday! Wonderful podcasts! I love listening to them while I knit in the morning before work; it centers me for the rest of the day. And… Now I can add Loop London to my travel wish list! Gorgeous aesthetic. I just found your podcast. You do a fantastic job and I already learned so much. I’d love to be entered in your give away. Looking forward to a future visit to London and Loop (and eating at Ottolenghi again, just down the road). If ever in London, Loop is where I’ll be! I’ll give this a go. Just because Loop is amazing…! Pick me! Would love to make my way back to London and some point and visit Loop. I am so excited that you’re back to a weekly posting – your podcast is one of my absolute favorites. The podcasts have been fun and inspiring, also great job on the variety! Thank you for sharing the stories and tales you do. I love listening to the podcast and look forward to each new episode. Thanks so much for all your interviews. I love hearing the journeys of all the fiber folk whose creations I love. Thank you for this lovely podcast. I adore your interviewing style and your fascinating guests. Haha! Upon seeing the title of the podcast I thought I’d be listening to a delightful British accent. I quickly realized she must be an American or at the very least, grew up in the States. I thoroughly enjoyed it nonetheless. I am fascinated by people’s journeys and how they got to where they are today. Life is full of different seasons in each of our lives. 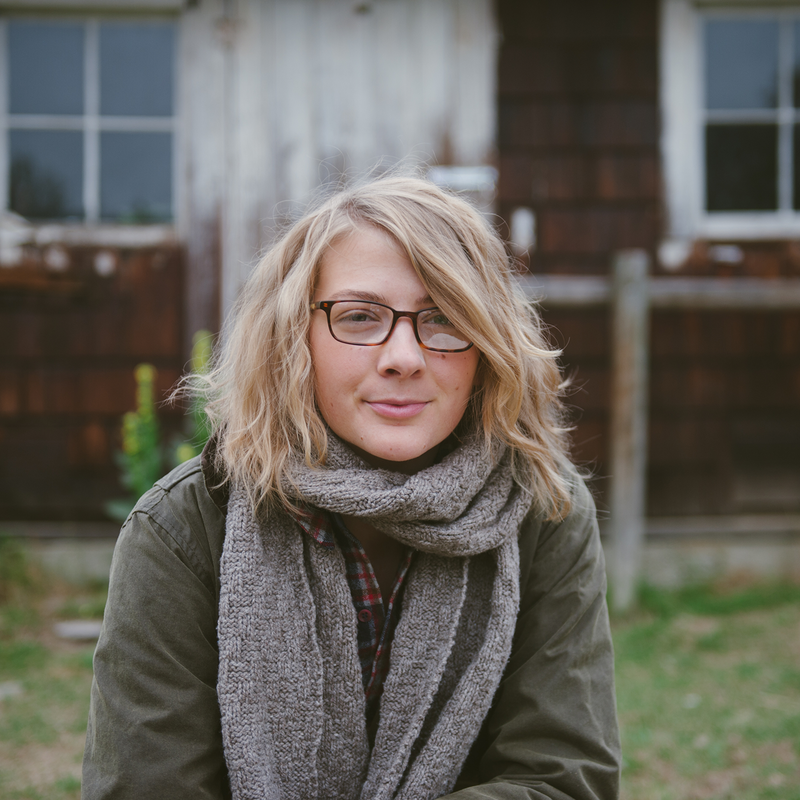 Ashley, you are a little gem and your podcasts and blog posts are a constant source of respite and renewal for me. Thank you very much. Thank you for your podcasts. Loop London is like some far-away dream goal. I know I’ll get there at some point, but don’t know when. In the meantime, I would love to hold a pice of this amazing store and it’s spirit in the book. It’s a lovely idea. (And I don’t know if it’s just me, but I found the audio a bit unclear today. Probably just me.) Thank you! Loop 10 is on my wishlist! 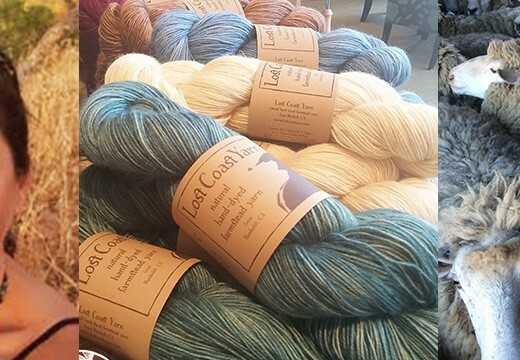 I also run a yarn shop and it is so nice to hear stories about other shopwoners. Thank you Ashley for your podcasts. Susan Cropper is so interesting. Another interesting podcast, although I had some difficulty with the audio bteaking up. Maybe the problem was at my end. Loops sound like a great place to visit, must get to London again. Always interesting to hear farm updates too. I had problems as well, must have missed every fourth word. Wow! I would love to win a copy of the Loop 10th Anniversary book. I had wanted to purchase it, but it was way too expensive for me. Susan Cropper’s aesthetic is so amazing. Thanks for sharing a bit of her with us. As always: It is a joy to listen to your wonderful podcast! Another great episode! I can’t wait to visit Loop. Beautiful! I enjoyed this podcast. 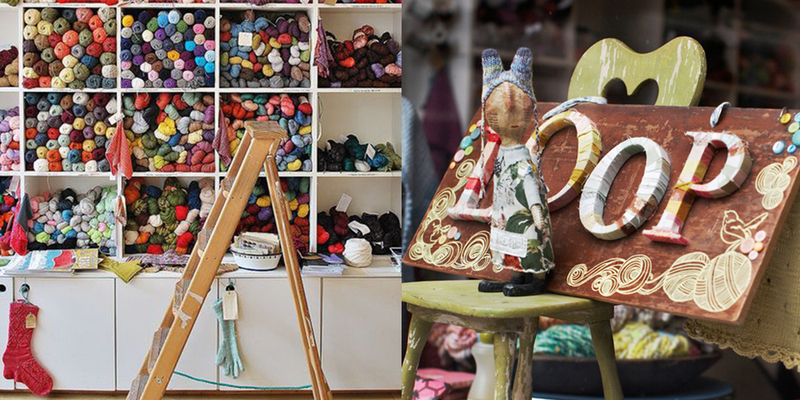 Another yarn shop on the to be visited list. Loop is such a lovely store. On my last visit to London I took a day long workshop there and just loved it. Definitely need to visit Loop next time! Love the episode! 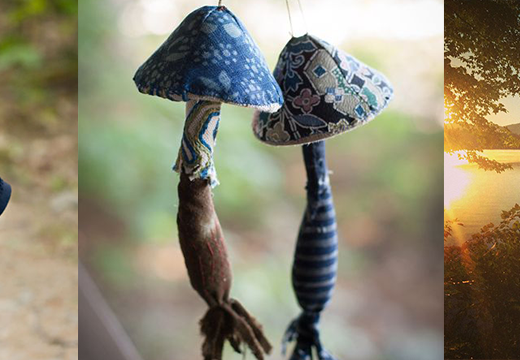 For Katia — the Japanese designer brand is mina perhonen — such beautiful work they do! Thank you Woolful love the podcast! Thanks for the timely episode. I will be in London in a few weeks, and look forward to visiting Loop! 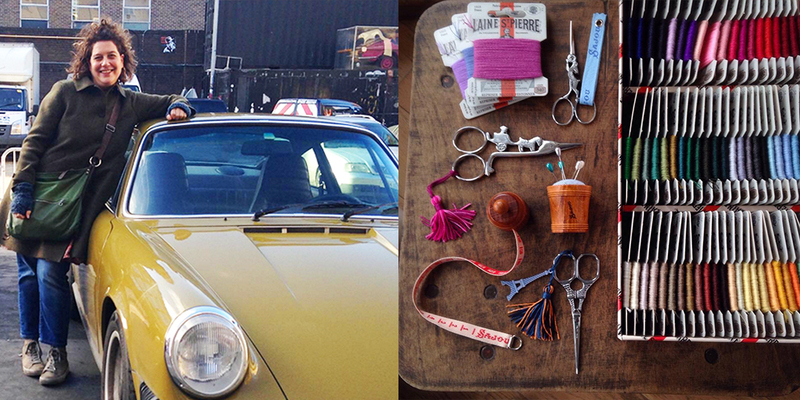 After listening to you and Susan, I want to go to London and visit her shop! Guess the book will have to do for now though. thank you for the great podcast. I am lucky enough that my office is only one tube stop away from Loop so I often go their in my lunch break to have a browse around or treat myself to one of the gorgeous yarns they have. 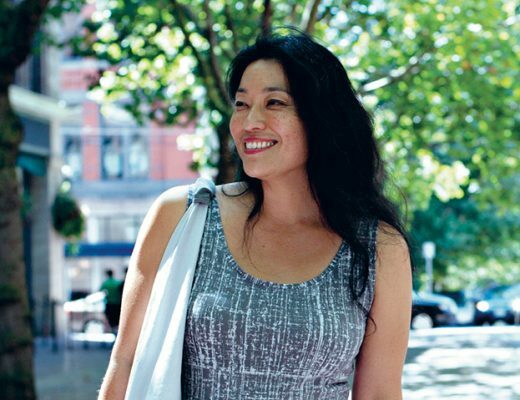 It was so interesting to hear Susan’s story; I hope I will meet her one day in person. I’ve been stalking Loop on instagram for months, and this summer I’ll finally be making a trip to London to see it for myself. Because why else would you go to London?! Fab giveaway, thank you. Oh, I would love to win this beautiful book! Thank you for doing a giveaway! Almost perfect gkmong as I’ll be in London on a month and visiting Loop is this time my top priority! As a non – native, I must confess I found the audio/phone line sometimes difficult to understand. This book has been very hard to get in the US, which seems like a great sign that it’s selling well! I’d love to see a copy. Thanks so much! Such lovely patterns. Love you podcast! What an inspiring space! I don’t know if I’d ever leave Loop if I was able to get there. This was the first Woolful podcast episode I’ve listened to and it was so interesting, what a great interview, Loop London sounds like a very unique and creative space I’d love to see it in person one day! Love the podcast and will definitely be catching up on previous episodes. What a sweet face Lulu has! Glad to read that she’s ok. Also super excited about this giveaway — I’ve been coveting Loop’s 10 since the first sneak peeks went online. Just heard a back podcast on Ryan at Quince Co. So good to hear about his background melding with his mom’s company! Looks like a wonderful show, I look forward to listening. Oh the Loop Book looks amazing! Thank you! I LOVE loop I went there with my husband last summer and it was to die for!!!!! I would go back in a second ! I loved following your pictures and posts on Instagram about your cows big day out! I had no idea she was sick, I am thrilled things are better. I visited Loop when in London this past fall. Such a magical place. Love your podcast Ashley, I look forward to it each week. Another great episode. Loop is a place I would to visit. Some day I will get there. And so glad Lulu has survived her adventure. Another fantastic podcast. I just this morning dropped my cousin off to the airport, who was returning to London and had said a good yarn shop was hard to find in London. I have emailed her the link to Loop already so it should be waiting for her when she lands! I only wish I could fly over to visit too. So glad Lulu is better. I just love hearing your farm stories. Loved listening to this interview of Susan and hearing the story behind the store. I suppose receiving a copy of Loop 10 would be the next best thing to visiting the shop in person! Just discovered your podcast! Thank you for all the work you put into it! I am still waiting for a quiet child free period to listen to the podcast, it’s my dream to go to Loop one day! Would love to be entered to the book giveaway. Going to Loop is always the highlight of my weekend! Ooh what a treat it would be to win! I just arrived in London this morning (from Melbourne, Australia) and Loop is definitely on my list to visit! 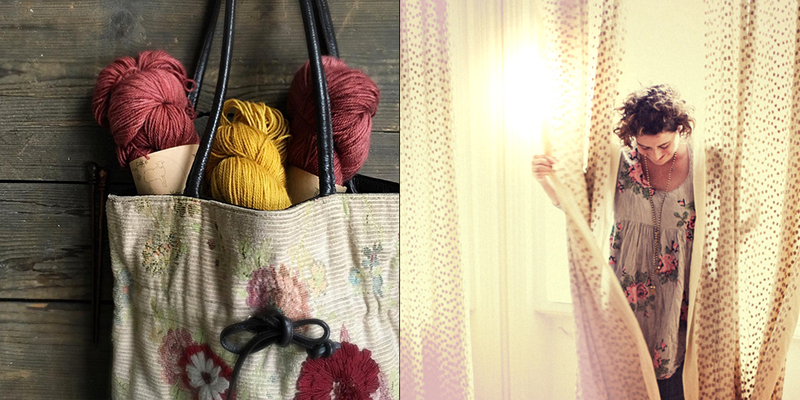 something to dream about – so many destinations, so much beautiful fiber! So want to visit Loop one of these days! Enjoyed episode. Thank you! I listen to your podcasts when I’m down in the barn hanging out with the sheep as we finish up our lambing season! Look forward to them every week! I had someone stay with me from London and I asked her to bring me a Loop book. I was so excited when she did. I would love another book on my shelf! I just found your podcast and look forward to listening to many more. Thank you! So great to hear about Susan Cropper’s background and her inspiration for the “Loop look,” which I wholeheartedly love. Glad your sweet cow is on the mend! 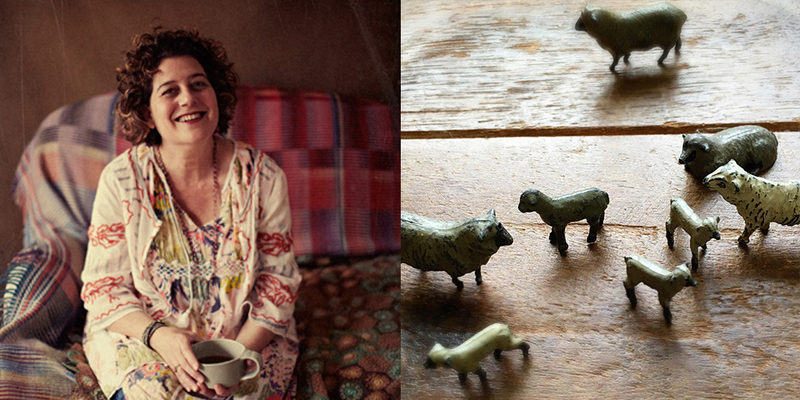 It was wonderful to hear more about Susan Cropper’s inspiration for beginning Loop. I’ve never been to London, however if I ever have the chance a visit to Loop is high on my list of musts! Having once a week podcast will be just wonderful. I haven’t missed one yet! Love the podcast and the knitting community. Keep up the great work, Ashley! Heading to London next year and putting Loop on my list of must sees! So glad LuLu is ok! Love the walking your cow down the lane picture. Oh, how I would love to visit Loop some day! Until then, I would love to win their new pattern book. I’ve been eyeing it in my local yarn shop, Fuzzy Goat, for quite some time! Such a beautiful book. I visited loop when in London several years ago. It was a welcoming and wonderful spot. I really enjoyed this episode. Wonderful coincidence, I’m in London for a few days, so today I’m heading to Loops. Happy Saturday! Loved your story . When I was just a very young girl and my parents were naive farmers, I had a Shetland pony that ate grass that was piled up and warm inside the pile. Bonnie became sick and bloated . The vet. Said to walk her if she got down she’d die..it was horrible. I was not even 10 yrs. old. Our dog Queenie and I slept outside next to the pony. I’ll never forget how great my parents were allowing me to do that. Your story sure brought back memories. I am travelling today and packed my iphone with interesting podcasts to try. Woolful wins. So intelligent and interesting. Thank you!